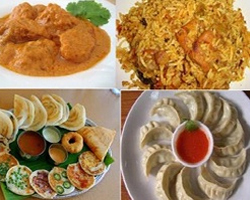 Every destination has a distinct food to mark its unique identity. Leh is a multicuisine city serving Indian, Tibetan and Chinese. The cuisine here indicates tints of these foreign impacts. Ladakh’s cuisine basically reflects a unique agricultural economy and lifestyle. Food in Ladakh is extremely influenced by its Himalayan ecosystem, vegetation, poultry availability, farming products and style of cooking with importance on steaming. Ladakh food is a mix n match of vegetables grown in farm lands, with variety of meat recipes, and traditional cookeries with soups. Visitors must taste out the local dishes here such as delicious Momos which are steamed dumplings stuffed with vegetables or meat. Thukpa (made up of wheat flour), noodle soup; Tsampa, known in Ladakhi as Ngamphe (roasted barley flour), and Skyu which is a heavy pasta dish with plenty of veggies. The locals also have an extensive use of apricot with which they prepare squash, wine, desserts and jams. Spices like cinnamon, clove, cardamom and saffron are also used in preparation of several dishes. The milk and meat of yak also plays an important role in Ladakh’s cuisine. The locals savour butter tea or gur tea, in which the butter made of yak is used. Also, locally brewed beer or Chang adds to the rich flavours of the Ladakh’s gourmet. You can attend the two days traditional food festival organized by the Women Alliance in Leh to experience the food & cuisine of Ladakh.